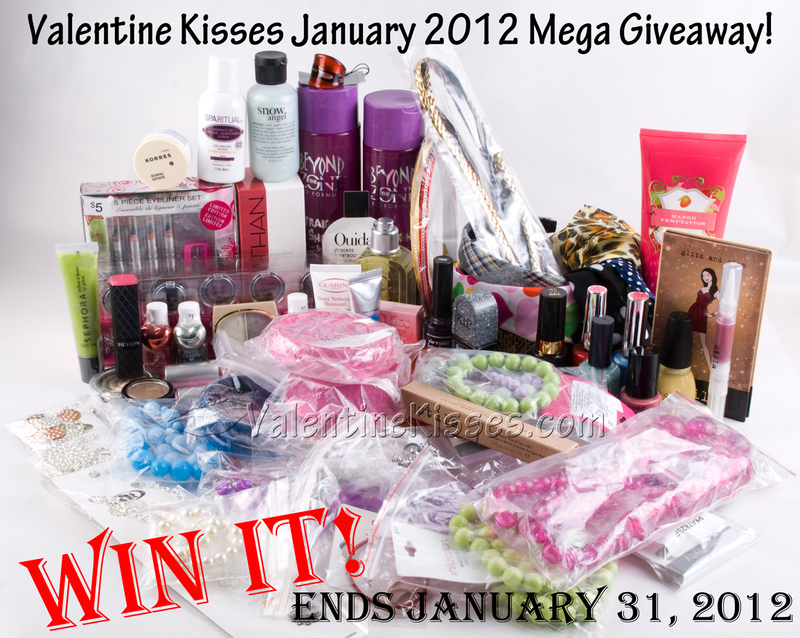 31 Lacquers: Valentine Kisses: The Valentine Kisses January 2012 Mega Giveaway! Win 65 Items!!! Valentine Kisses: The Valentine Kisses January 2012 Mega Giveaway! Win 65 Items!!! You've got to see this giveaway package to believe it. Over 65 items! Good luck. It was actually a huge mistake made by me, and if you didn't wrote me that comment I wouldn't even have notice it xD I'm such a mess lately, I planned to end it this week but wrote by mistake the date of next week. I'm lost lately, because I'm in the middle of my exams. I'm very very sorry, if you didn't had the chance to enter my giveaway, there will be a new one tomorrow, promised!!!!!!! And please forget that previous comment of me, I was still not getting what you meant and only realize it when someone else asked me the same question.